Ethiopia The Rising Opposition ? GONDAR, Ethiopia, Jul 18 2013 (IPS) – Since the violent quashing of political protests after the ruling party won Ethiopia’s 2005 elections, this East African nation has seen little in the way of political dissent. That is, until the last few months. Since June, the country has witnessed mass protests in three of its major cities. Despite the significance of these protests, observers disagree over how much they signal a rebirth for the country’s opposition movement and the government’s tolerance of it. “Until the recent protests, most had lost faith in the democratisation process and opposition parties,” Hallelujah Lulie, a political analyst from the Ethiopia-based Institute for Security Studies told IPS. When the ruling Ethiopian People’s Revolutionary Democratic Front won another term of office in 2005, thousands of protestors took to the streets in protest, as the party has been in power since 1991. It had appeared that the ruling party rigged the vote as many expected the opposition Coalition for Unity and Democracy and the United Ethiopian Democratic Forces to win. The crackdown led to the arrest of several opposition party politicians, with many others being forced to flee the country and give up politics. “Recent opposition activities, however, show that people are beginning to recognise the opposition again, which could be a big boost for the domestic opposition parties,” said Hallelujah. On Jun. 2 a new opposition group, the Blue Party, organised mass protests in the country’s capital, Addis Ababa. Thousands marched down one of the city’s main avenues, calling for the release of political prisoners and journalists and the reform of government policies. The protest was given permission, and no arrests were made during, before, or after the demonstration, leading some to believe that the government had become more tolerant towards opposition activities. “While there have been no arrests so far, we have credible information that the government is plotting to break up our movement and label us as terrorists. We have seen no change in the government or a willingness to engage in dialogue with us,” Yilkal Getnet, chairman of the Blue Party, told IPS. Getachew Reda, spokesman for the Ethiopian Prime Minister’s office, told IPS that they would not negotiate with the protestors, as there are proper legal channels to address issues that the opposition politicians had not exhausted. “Despite a lack of response from the government, we believe that the opposition movement will continue to gain momentum and are deeply encouraged by the (recent) protests,” said Yilkal. On Jul. 14, the major opposition party, the Union for Democracy and Justice (UDJ), organised protests in two major cities, Gondar and Dessie, in north and north-central Ethiopia, respectively. It was part of a campaign ‘One Million Voices for Freedom’, which sought to get one million signatures on a petition with demands similar to those of the Blue Party. In Gondar, protestors marched through the capital and called on the government to stop exploiting the anti-terrorism law and release those whom the law has been used to imprison, including political prisoners andjournalists. But bad weather and reports of intimidation prior to the march meant that the protestors numbered in the hundreds at most. Hallelujah believes the protests could be a sign that the opposition is emerging again, he argued that they still face huge challenges that could hinder their chances of success. He said that it is hard for opposition parties to increase their membership freely, to raise funds and even to rent a hall for party meetings. In the run-up to the protests in Gondar, UDJ party leaders say they faced extreme harassment by the regional state authorities. According to the UDJ, on Jul. 13 local police surrounded the office and would not let their members out all day. Only at the last minute an unofficial deal was reached with the local commander to hold the protest, or so claim party members. Also, over 10 members of their group were arrested for distributing leaflets to the general public in the days leading up to the protest. Peering through rusty metal bars at Gondar’s Police Station 3, a simple mud hut structure, Amedemakryam Ezra, a UDJ party member, said he was arrested two weeks ago for distributing leaflets. Before he could finish his sentence, another party member who was also arrested for distributing leaflets appeared. Maru Ashagere, a hairdresser, told IPS that the local authorities went to his parents’ chicken farm and said they would poison all the chickens as punishment for their son’s political activities. Not only were party members harassed, but some Gondar residents told IPS they were too scared to join the protests due to threats made throughout the city. While some might have not have joined out of fear, it appears that many around Gondar did not join because of a lack of faith in the UDJ and the opposition movement. Several residents told IPS that they did not trust the UDJ or believe that it could find real solutions. Ethiopia on the 20th anniversary of Irredentism, War & Famine is ready to balkanize in model of Somalia and Yugoslavia, Muse Tegegne, Prof.
Ethiopia inaugurates the 20th year of Ethnical irredentism balkanizing of the unitary state as existed for over 3000 years. This dictatorial regime of Melese Zenawie came to power at the demise of the satellite regime of Mengistu Haile Marian two years after the fall the iron curtain in 19191. Melse acessed power by manipulating famine aide to buy arms at the expense of millions starving in the region of Tigre and the rest of Ethiopia. The recent “day of rage” counter demonstration planned by democracy activists failed to materialize in the model of Arabic Awakenings is due to two principal reasons – first of the absence of a grass root movements to embrace their call since the diasporas has been busy collecting money criticizing one another in pal talks rather than organizing mass under trodden inside Ethiopia , thus end up being a media tiger – and second of the Ethiopian youth is at embryonic stage of social networking highly controlled by the state. If any, they are all those the benefiter of the regime who manipulated the internet not the mass youth like that of Egypt and Tunisia. though at the gunpoint the turnout at Addis Ababa’s Meskel Square was a fraction of the one million predicted by the dictator. The dictator order to cut down the event to its minimum gave further instruction for the office workers to go back to work. In many part of country the regime deliberated its 2th anniversary the day before to circumvent the mass uprising. 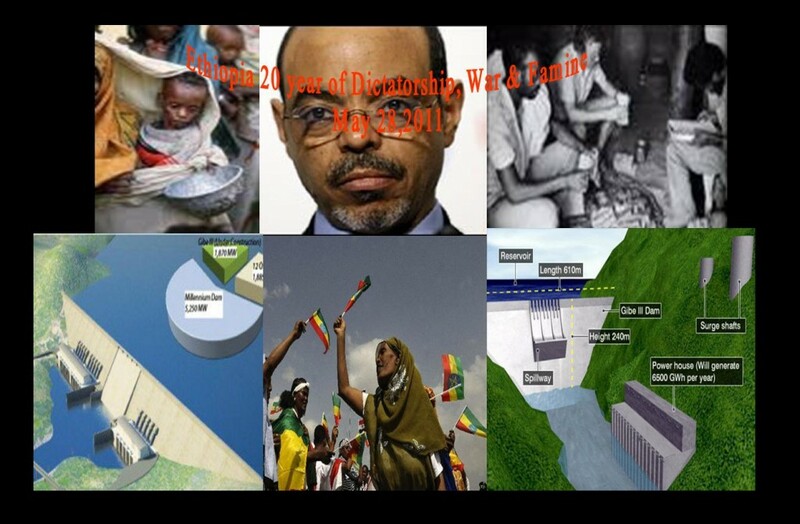 The dictator Melese Zenawi’s address bit the record of minimum speech of 5 minutes to commemorate his coming to power 20 years ago, he used to make a long brain storming at the model of totalitarian regimes. Rather he tried even to drawn it in the Nile by calling for support of construction of a massive dam. This I unprecedented challenge for downstream riparian by constructing a megalomaniac death dam which eventually will drain and dry the flow of the Nile river by stopping the annual flooding., while Ethiopia endowed with plenty of thermal energy accessible with a less cost to human and environment consequences in a country over 3 million starveling. The last two decades of Melse’s regime took the starving Ethiopians for three major wars_ two Eritrea and one with Somalia. He dumped the election of 2005 which he lost in a day light. In 2010 he rugged the election by assuring his 3 decades of power in a dictatorial regime he created. Today the regime is confronting a war in Somali region, in Kenyan border, and in the West of the country a conflict not yet accessible to the international media. When it comes to liberation movements they have not yet found their Ethiopianist identity struggling inside the country. Many seems to follow the rhythm imposed by the belligerent regime of Eritrea or others or those movements fighting to create an independent Ethnic region in the model of Southern Sudan or Somaliland. If the country could not find an avantgardist alternative to bring it to a democracy and consolidate the national state hood it will catch the syndrome of Somali and that of Yugoslavia leading to eventual of balkanization based on the Ethnical constitution and its article 39 which permits self determination up to independence. This the only constitution having such article in the world. 1. Every nation, nationality or people in Ethiopia shall have the unrestricted right to self determination up to secession.